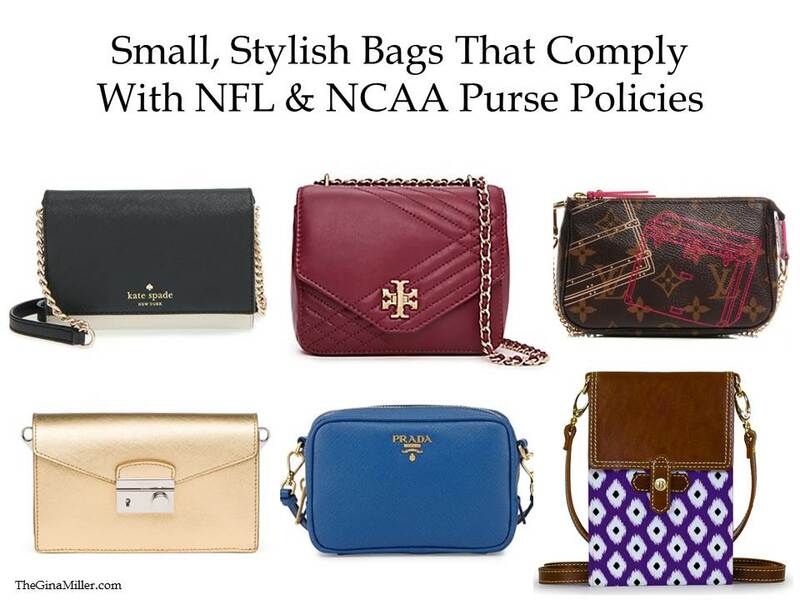 25 NFL & NCAA Purse Policy Approved Bags | Gina Miller's Blog - A working mom's blog about fitness, travel, handbags & beauty. You can bring a large, clear bag into game. If you have an opaque one, it must be tiny. Unless you have to bring, say, diapers and stuff for a kid, I would forgo a big bag and simply bring a small one. It's easier to carry and doesn't broadcast your personal belongings to the world. Frankly, a tiny crossbody also looks better. Those clear totes? Blech. Wondering if your cute little crossbody complies with the rules? Here's a tip: fold a piece of 8.5" x 11" paper in half. If your bag fits within the folded piece of paper, it will typically be allowed into a stadium. Always check the venue's website. Simply Google "(Insert name of venue) Purse Policy". Click HERE for the NFL's bag and purse policy. I have been covering games and attending games all my life. As a reporter covering a game, I can bring in a huge bag full (like this one) of hairspray, notebooks, my iPad, makeup, pens, whatever other crap I need. Trust me when I say this: I would rather carry a tiny crossbody. They are so much easier to tote around because they allow you to eat, drink and cheer hands-free. They don't weigh you down at all. Barrington Gifts makes a great bag called the Stadium Crossbody that you can customize in your team's favorite color and in your favorite pattern. You can also get the bags debossed with your initials. Bonus? It's only $85. For you LV-lovers, your tiny Louis Vuitton Pochette is small enough. I once saw an LSU mom buy herself and her daughters four of them before heading to a game at AT&T Stadium. Click HERE for a selection of LV Pochettes from my favorite online consignment site, Fashionphile.